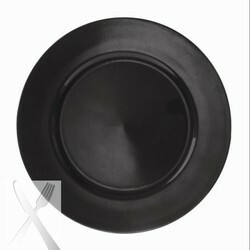 Home > Products > Ten Strawberry Street Lacquer Round Black Charger Plate 13"
Set a simple yet contemporary table with the Ten Strawberry Street Lacquer Round Black Charger Plate 13". Featuring a classic black finish, this product coordinates well with a variety of dinnerware pieces, enhancing table decor at your fine dining establishment. Perfect for weddings, banquets, and other upscale events, this piece adds visual flair while providing protection against spills and mess that might otherwise stain your tablecloth. Thanks to its high quality lacquered acrylic construction, this exceptionally durable charger is lightweight and adds a luxurious touch to any setting without breaking the bank. To keep this charger plate in excellent condition, hand washing is recommended.